Amidst all the noise in the music concert scene came the voice of an angel… Sarah McLachlan's mezzo-soprano vocal range became a breath of fresh air, like a soothing balm that can ease a wearied mind, a broken soul, and mend a broken heart. With the recent announcement that she'll be back on the road for a new concert tour. And yes, she's swinging by for a one-night-only engagement at the Meadow Brook Amphitheatre on Saturday 10th August 2019. 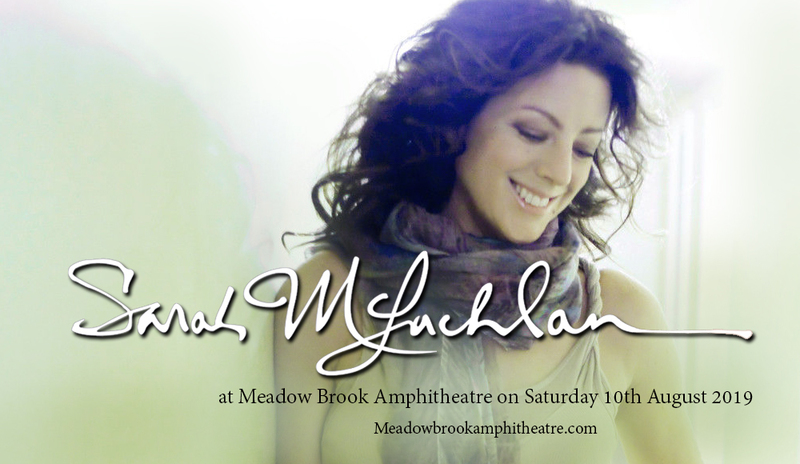 Experience the power of music, a gentle yet compelling force that can only come from the vocal prowess of Sarah McLachlan. Tickets for this show are highly in-demand. Be quick and wise by booking your seats early. With a fast and easy click on the 'buy tickets' button, you'll be well on your way to witness one of the most esteemed artists in the world. Get your tickets now! Did you know that Sarah McLachlan started out playing rock music in high school? At a young age of 17, she was given a record deal and released her debut album "Touch" in 1988. It positioned her as a major pop star in Canada and the US. As the 90s ushered in, Sarah found a new voice, a soothingly powerful mezzo-soprano vocal range that broke her into superstardom. Her early singles "Possession," "The Path of Thorns (Terms)," "Building a Mystery," and "Last Dance", solidified her popularity, reputation, and artistic credibility on a bigger scale, in terms of album sales, and chart positions covering worldwide territories, critical acclaim, and prestigious recognitions and citations. She has sold more than 40 million albums worldwide. She has pocketed two Grammy Awards (out of four nominations) and won four Juno Awards. She is also the founder of the Lilith Fair tour, placed all-female artists on centerstage, and has been recognized as one of the most iconic music movements and festivals ever mounted. Don't miss this breathtakingly enchanting performance by a truly unique and influential artist. It's an experience of a lifetime. Book your tickets now!